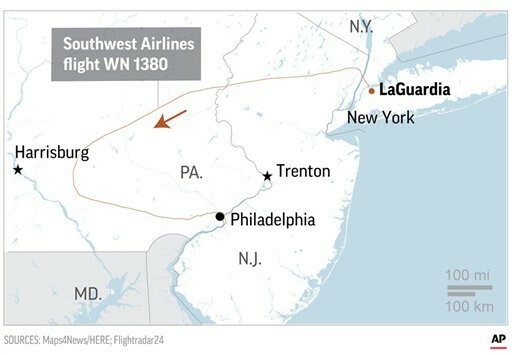 The Boeing 737 Southwest Airlines Flight 1380 was on its way to Dallas from New York, carrying 144 passengers and five crew members. For the first 20 minutes of the four-hour flight, everything seemed fine and the plane had climbed above 30,000 feet. Then, a "loud boom" suddenly jolted the plane, sending Flight 1380 into total chaos. 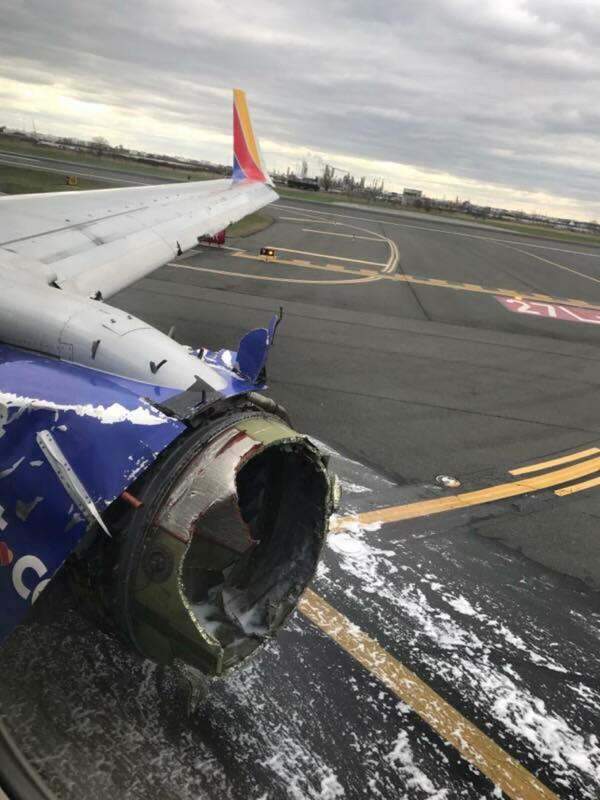 As reported by The Guardian, preliminary investigations revealed that the left engine showed evidence of "metal fatigue", causing one of the engine blades to snap off and puncture the fuselage. 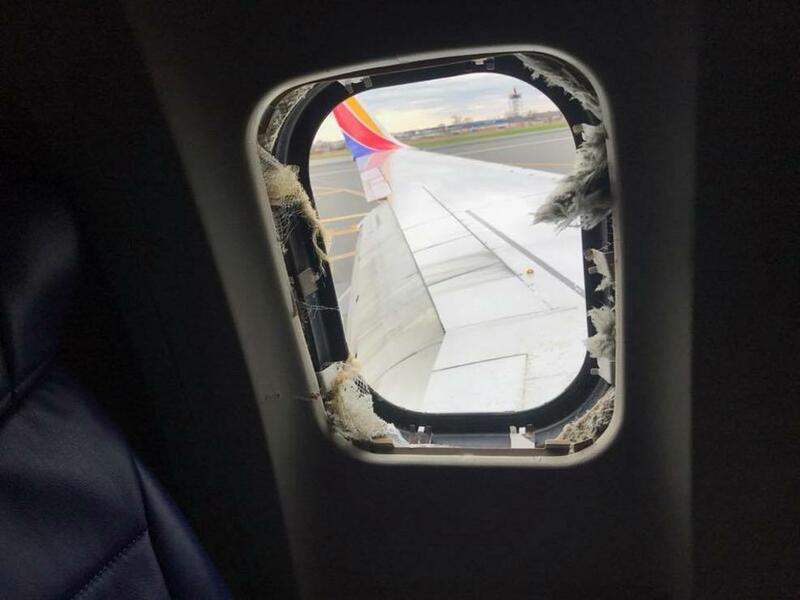 One window panel of the plane was hit by debris from the blown engine. Shults calmly informed air traffic control about the problems and arranged for emergency crews to meet her plane at its new destination. The pilot said, "Can you have the medical meet us there on the runway as well. We have got injured passengers." An air traffic controller replied: "Injured passengers, OK, and is your airplane physically on fire?" Shults replied, "No, it’s not on fire, but part of it is missing. They said there is a hole and, um, someone went out." "Um, I’m sorry? You said there is a hole and someone went out?" the air traffic controller responded with a worried tone. He then collects himself and tells Shults, "Southwest 1380 it doesn’t matter, we’ll work it out there. So the airport’s off to your right." Officials said that the descent happened in "a fairly rapid manner." 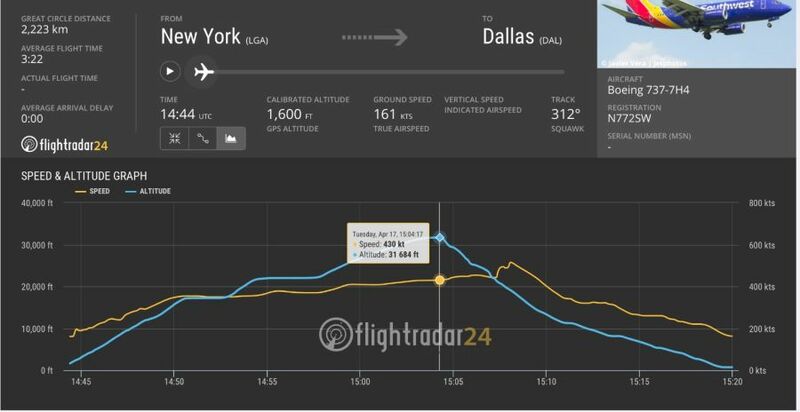 Flight information provided by FlightRadar24 showed the plane dropped from over 30,000 feet to 13,000 feet in five minutes. The entire descent took about 15 minutes. 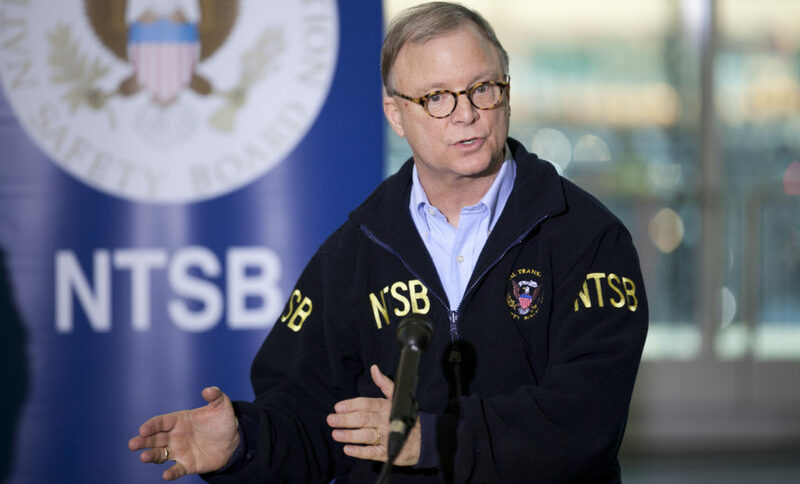 At a news conference yesterday, Sumwalt said he flew the Boeing 737 for a decade when he was a commercial pilot and was amazed when he heard the radio communications from the cockpit. He said, "You could hear their intonation. The pilots seemed very calm and assured about what they're doing." "My hat is off to them. They behaved in a manner that their training would prepare them for." According to NBC News, Matt Tranchin, 34, said the travellers burst into applause once they landed. "There was a lot of hugging. I personally hugged the pilot. I think just relief, relief that we get to live for another day." Tumlinson, 55, who was with seated next to his wife thought they were not going to make it. 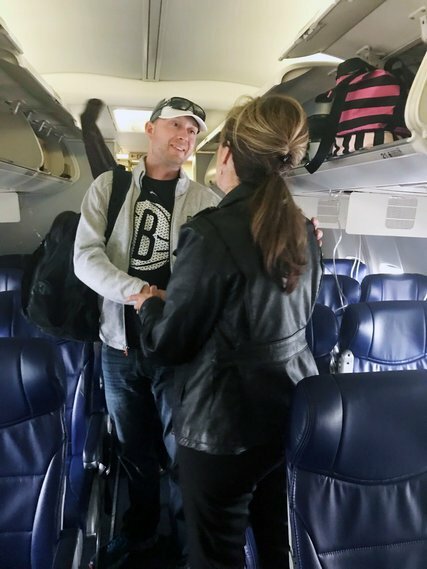 "But I got another day of my life because of that lady and the co-pilot," he said. "She's an angel. What more do I need to say about her?" "She has nerves of steel. That lady, I applaud her. I'm going to send her a Christmas card with a gift certificate for getting me on the ground. She was awesome." 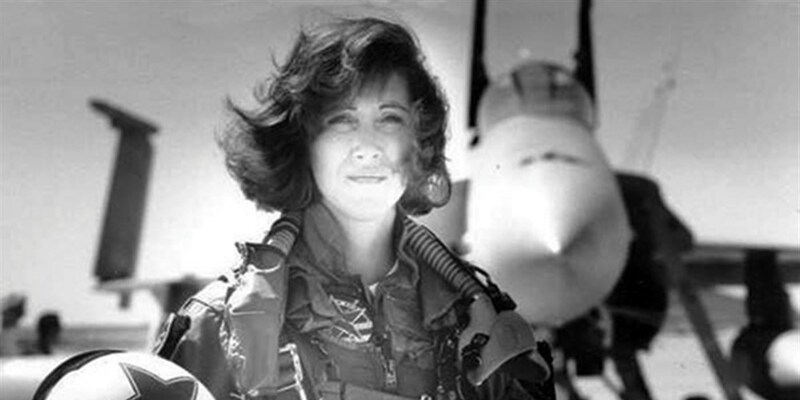 Tammie Jo Shults, 56, almost never made it as a pilot as she was denied entry to attend aviation career day at high school because of her gender. However, Shults never gave up on that dream and always had the urge to fly. After graduating with degrees in biology and agribusiness, she applied to the US Air Force but they would not allow her to take the test to become a pilot, as quoted by fighter plane blog F-16.net. She ended up applying for U.S. Navy and was accepted. 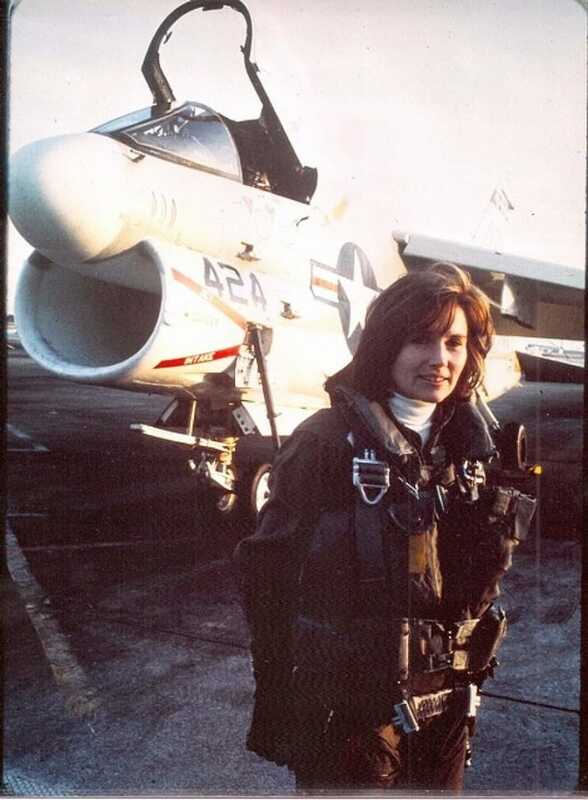 She served in the Navy for 10 years, reaching the rank of Navy lieutenant commander and was one of the first female F-18 pilots. She left the Navy in 1993 and joined Southwest Airlines to work as a commercial pilot. 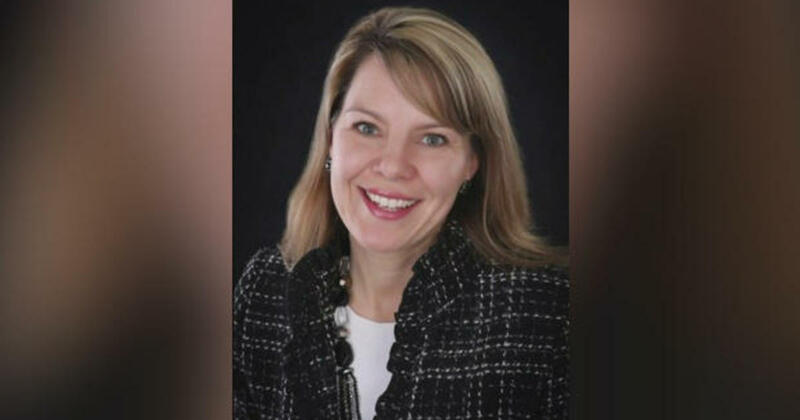 The victim was Jennifer Riordan, a mother-of-two and bank vice-president at Wells Fargo in Albuquerque, New Mexico. The cabin depressurisation had nearly sucked Riordan out of the aircraft but she was pulled back by other passengers. The 52-year-old cop is a retired military officer. The incident went viral after AC Mizal ranted about it on a Facebook video. One of the teachers pleaded guilty to 27 counts of cheating. Once a writer on SAYS. Now I'm just the "admin" on SAYS' social media.